When it comes to feeding your canary, seed is just not enough if you are looking to have your bird live up to it's full capacity. Similarly to humans, a canary needs a variety of foods, vitamins, and minerals. Daily seed should be provided and serve as the main course for your canary. Make sure food dishes are cleaned routinely and always full. Be careful not to overlook feedings , as a canary, cannot survive for very long without food. A close look at your food dish may also reveal empty husks that the canary has pulled the seed from. In addition to seed, small portions of fresh fruits and veggies serve as an excellent source of nutrition and provide the much needed variety to satisfy your Fife. Ensuring that your bird recieves freshly washed produce on a daily basis helps boost his overall health and longevity. Below is a list of some suitable examples of tasty treats for your birds. Our birds recieve cuttlebone and grit, as a calcium source, on a regular basis to help trim their beaks, gear up for moulting, and to help support our hens during the breeding season. Egg food is rich in protein and given throughout breeding season as a boost for the hens and as the vital food source for the baby chicks development. Daily water changes are a necessity, as well as, making sure the drinkers are clean to avoid harmful bacterial growth. * These foods should be fed in moderation and should be about 25% of a canaries daily diet. Canaries should be housed seperatley to avoid squabbling and stress. 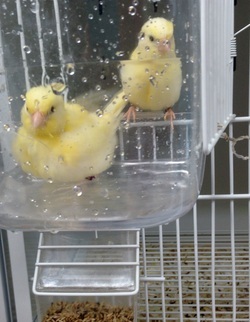 Maintaining a clean environment is another critical key in owning or breeding canaries. Perches should be routinley checked and cleaned as needed. Bedding material should be changed weekly or more frequently if necessary. Nooks and crannies should be washed weekly to avoid unwanted guests in your canaries living quarters. In addition bird baths should be made available as often as possible to remove dust and dirt that may have collected in their feathers. Water should be no more than half an inch deep and be room temperature. Natural light must be provided as a Vitamin D source and placement of your cage or aviary should avoid drafty areas. Canaries thrive on a "sunrise" "sunset" schedule. Using a cover for your cage may aid in encouraging this routine. While keeping a clean environment is important all year it is even more of a priority with the warmer weather. Making sure those unwanted visitors, like red and air sac mites , stay far, far away can seem daunting, however, with a few small steps can be easily controlled and avoided. Mites will adapt and survive in almost any temperature or living condition but seem naturally be more partial to warm, humid climates. They enjoy nice cozy areas like cage bedding, tiny cracks and crevices, and nests. Red Mites typically feed off the blood of the birds, while Air Sac Mites attack a birds lungs and throat. Although a mite having a lifespan of about seven days may seem unintimidating, it is their rapid rate of multiplying especially in the Spring and Summer, that can leave your room infested or worse your birds infested. Some mites are visible to naked eye, and others are not. A great way to check if your cage is infested is to place a white paper on the cage floor at night, when mites tend to be more active. Other ways of telling may include checking your bird's skin and looking at cage trays, nesting boxes, etc. as you clean. A few signs that your birds may be infested with those pesky little critters would be ruffled or damaged feathers, constant preening or "itching," weight loss, agitation or signs of stress and irritability. In cases of Air Sac mites, you will notice signs of trouble breathing, wheezing, or even a stop in male canaries singing. So how do you go about keeping your aviary free from mites? First and foremost keeping your cages and surrounding floors, walls, etc. clean and fresh is crucial to protecting your Fifes and Waterslagers. Changing bedding, washing cage trays, grates, perches, and keeping the small crevices of the unit/home free of seed, husks, feathers, and other various material is a great way to start. Food and water dishes should be emptied frequently and washed. 5% Sevin Dust is a safe insecticide, that when used in small amounts properly, will aid in fighting off bugs and insects while maintaining the safety and health of your birds. A tsp. of powder under the bedding material is all that is needed. For more information on keeping your environment clean see Canary Care. Keeping a clean home is not the only thing necessary in avoiding mites. Making sure your canaries are well maintained goes hand in hand with a clean environment. Baths with fresh, room temperature water, must be provided to each individual bird often. Bird baths of all sorts of shapes, and sizes can be found on various websites. Fancy Canary is partial to S.T.A. outside clear baths, as they attach easily to the cage without mess, and provides an enjoyable view of the bird bathing, which can be quite entertaining to watch. For an example of bird bathing please see our video link under the "Fife" tab. In addition to routine bathing there are various drops, such as Scatt, that can help prevent or fix a mite problem and is available at most avian supply or pet stores. Lastly, keep an eye your humidity levels...high humidity levels can often attract and help mites thrive, as well as, grow mold in the bedding.